What is a special treat for some of us can bring back an entirely different memory for others. My friend Humphrey Howie from Fat Goose Fruits reminisces about the dread of yet another asparagus meal evoked in him. He remembers, that his father would, daily bring home a dipping basket of the asparagus that still grows wild in their orchards. The thought of another meal of it, he says, was sickening! Humphrey also recalls that is was pretty much the same for everyone in the region; people were poor and eating what was hunted and found was pretty much the staple diet. Humphrey’s story came as a surprise because asparagus, even in the early 80s when I opened Mistress Augustine’s, had remained a much celebrated short season and you either had to be rich or have your own crowns to enjoy it in quantity. The start of the season always brought with it a celebration as it appeared in many forms on menus in Adelaide. Even in the early 80s tinned asparagus was still a common, though much maligned canapé but those little canned asparagus soft white bread rolls where then and still are, quite popular. pictured left Darling Street Riverland [South Australia] asparagus and from Patlin Gardens variegated sorrel, coriander and endive…organic principles, soil grown. By the late 80s the strict opening and closing of the asparagus season had vanished as asparagus flooded in from everywhere from Zimbabwe, China to Peru and other places in South America. Completely tasteless asparagus saturated the market and it relentlessly appeared on menus for 12 months of the year. A handful of chefs remained faithful to the local season, but the mention of asparagus on a menu in the middle of January still heralds a meal of bitter disappointment. The asparagus season remains celebrated at the Rockford Stonewall Table where it comes to the kitchen in abundance straight from the garden half a kilometer down the road. I love to see the spears covered with the little terracotta kloshes that will keep them white. 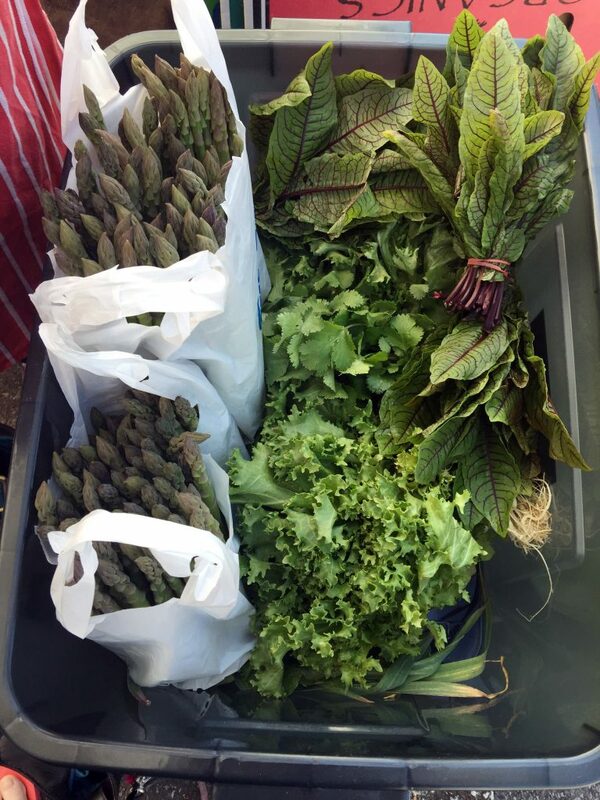 This season is reason to celebrate as Riverland chefs Natalie and Jamie Harris bring their superb asparagus to the Adelaide Showgrounds Farmers’ Market on a weekly basis for the season opposite Patlin Gardens. 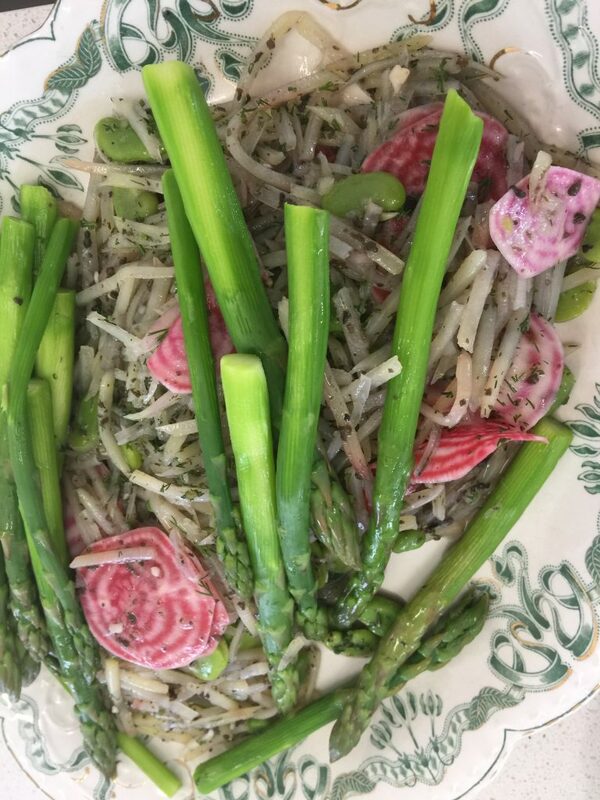 Do not expect their asparagus to be uniformly sized and coloured (a dead give away for commercial asparagus), but do expect the most incredible flavours……something to celebrate! don’t be afraid asparagus can be anything you want it to be! There is a great deal of difference between commercially grown and wild farmed asparagus when it comes to preparing it. With commercial asparagus you can generally use the entire spear and don’t need to scrape it, but with wild asparagus you need to snap it and it is generally a good idea to scrape the thicker asparagus spears. There is no comparison in flavour and often commercial asparagus is kept for month past the season in coolrooms [chillers for Americans]. Don’t waste your time trying to do anything with the tough ends. After years of fruitless experimentation my advice is…forget it and give them up to the compost.